Diamond Ring Made in 14k White Gold See Specifications for more details. SHIPPING DETAILS Delivery Type: Doorstep Deli..
Diamond Ring Made in 14k White Gold (0.35 ct) See Specifications for more details. SHIPPING DETAILS &nb..
Diamond Ring Made in 14k White Gold (0.46 ct) See Specifications for more details. SHIPPING DETAILS ..
Diamond Ring set in 14k White Gold (0.53ct) See Specifications for more details. SHIPPING DETAILS Deliv..
Diamond Ring set in 14k White Gold (0.96 ct) See Specifications for more details. SHIPPING DETAILS &nbs..
Diamond Ring set in 14k White Gold (1.2cts) See Specifications for more details. SHIPPING DETAILS Deliv..
Diamond Ring set in 14k White Gold (1.5cts) See Specifications for more details. SHIPPING DETAILS ..
Diamond Ring set in 14k White Gold (3.4cts) See Specifications for more details. SHIPPING DETAILS Deliv.. Engagement Diamond Ring made in 14k Gold See Specifications for more details. SHIPPING DETAILS ..
Stone Set Shoulders,Engagement,Solitaire,Channel set,Diamond Set yellow gold 18k See Specifications for more details. SHIPPING D..
Solitaire,Diamond Set,Engagement white gold 18kSee Specifications for more details. SHIPPING DETAILS Delivery Type: Doorstep&nbs..
Solitaire,Diamond Set,Engagement white gold 18k See Specifications for more details. SHIPPING DETAILS Delivery Type: Doorst..
Solitaire,Diamond Set white gold 18 k See Specifications for more details. SHIPPING DETAILS Delivery Type: Doorstep De..
Stone Set Shoulders,Engagement,Channel set,Diamond Set white gold 18 k See Specifications for more details. SHIPPING DETAILS &nbs..
Solitaire,Engagement,Heart Shaped white gold 18k See Specifications for more details. SHIPPING DETAILS Delivery Type: Doors..
Solitaire,Engagement,Diamond Set yellow gold 18k See Specifications for more details. SHIPPING DETAILS Delivery Type:..
Solitaire,Engagement,Stone Set white gold 18k See Specifications for more details. SHIPPING DETAILS Delivery Type: Do..
Gold 2.5mm 11 Stone Diamond Set Wedding Ring 14k See Specifications for more details. SHIPPING DETAILS Delivery Type: Doors..
Gold 2.5mm 3 Stone Diamond Set Wedding Ring See Specifications for more details. SHIPPING DETAILS Delivery Type: Door..
Gold 2.5mm 5 Stone Diamond Set Wedding Ring See Specifications for more details. SHIPPING DETAILS Delivery Type: Door..
Gold 4mm 18 Stone Round Brilliant Diamond Set Wedding Ring 0.15ct See Specifications for more details. SHIPPING DETAILS &nb..
Gold 4mm 3 Stone Prinlcess Cut Wedding Ring See Specifications for more details. SHIPPING DETAILS Delivery Type: Door..
Gold 4mm 9 Stone Round Brilliant Diamond Set Wedding Ring 0.07ct See Specifications for more details. SHIPPING DETAILS Deli..
Gold Princess Cut 10 Stone Diamond Wedding Ring 4mm See Specifications for more details. SHIPPING DETAILS Delivery Type: Doorstep..
Gold Princess Cut 5 Stone Wedding RingSee Specifications for more details. SHIPPING DETAILS Delivery Type: Doorstep Delivery Time..
Gold Princess Cut Court Shaped Diamond Wedding Ring See Specifications for more details. SHIPPING DETAILS Delivery Ty..
Beaded Band Diamond Ring Set in 14k White Gold (2.5cts) See Specifications for more details. SHIPPING DETAILS Deli..
Gold4.50mm Double Row Diamond Wedding Ring (0.30ct) See Specifications for more details. SHIPPING DETAILS Delivery Ty..
Half Eternity Ring in 14k White Gold in Pave set Diamonds(0.5ct) Perfectly stunning, this diamond eternity ring features round cut diamond in a Pavè&nbs.. OVAL SHAPE BLUE SAPPHIRE AND DIAMOND RING MADE IN 14K WHITE GOLD (1.36ct Bs) Defined by vintage elegance, this exquisite sapphire ge.. OVAL SHAPE BLUE SAPPHIRE AND DIAMOND RING (1.36ct Bs) Defined by vintage elegance, this exquisite sapphire gemstone ring is fl.. OVAL SHAPE BLUE TOPAZ AND DIAMOND RING (1.36 ct Bt) Defined by vintage elegance, this exquisite topaz gemstone ring is flanked .. OVAL SHAPE BURMESE RUBY AND DIAMOND RING (1.36 ct Rby) Defined by vintage elegance, this exquisite ruby gemstone ring is f.. OVAL SHAPE EMERALD AND DIAMOND RING (1.36 ct Em) Defined by vintage elegance, this exquisite emerald gemstone ring is flanked b.. 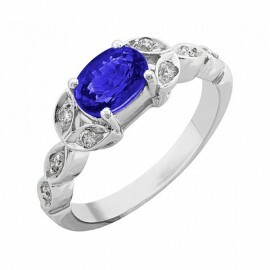 OVAL SHAPE TANZANITE AND DIAMOND RING (1.36 ct Tz) Defined by vintage elegance, this exquisite tanzanite gemstone ring is flank..
Princess Cut Diamond Ring set in 14K White Gold See Specifications for more details. SHIPPING DETAILS Delivery ..
Princess Cut Diamonds in a Channel set in White Gold (1 ct.) Princess cut diamonds in a channel set, with an elegant and sophisticated design m.. The Crossway Ring with 5 Exquisite Diamonds in White Gold and Diamonds (1 ct.) Perfectly stunning, this diamond ring features round cut diamond.. The Crowne Diamond Ring in White Gold and Diamonds (0.66 ct.) A crown like shaped design, with an elegant and sophisticated de.. The Curved Diamond Ring in White Gold (0.5 ct.) The curved ring has 9 exquisite diamonds in a Pavè setting. Perfectly stunning, thi.. The Garland Ring in 14K white gold with Vs Quality diamonds( 2.5ct) A gorgeous ring which defines the sign of eternity, only three times more. The ring c.. THE GRÁINNE RING (0.39 ct) .An intricate floral design featuers 15 round brilliant round cut diamonds in white gold. S.. The Half Eternity Band in Yellow Gold with Diamonds (0.28ct) Perfectly stunning, this diamond eternity ring features round cut diamond in a ch.. The Half Eternity Band in Yellow Gold with Diamonds (1 ct.) Perfectly stunning, this diamond eternity ring features round cut diamon.. The Maharani Half Eternity Ring in White Gold and Round Cut Diamonds (1 ct.) Perfectly stunning, this diamond eternity ring features round cut .. The Slim Half Eternity Ring in White Gold and Diamonds (1/5th ct.) A slimmer version of rhe Half Eternity Ring. Perfectly stunning, this d.. The Twirl Ring in White Gold and Diamonds (0.3 ct.) See Specifications for more details. SHIPPIN..